This week, we’re getting to know the six finalists who have made it through the first round of voting in our art and design contest, Beer Is Culture. 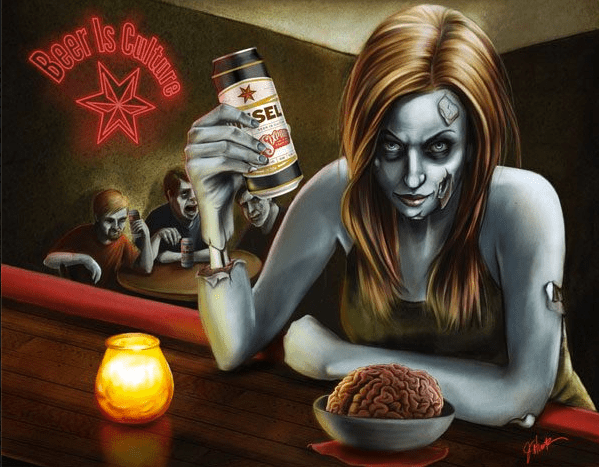 Meet Jamie Huntsman, whose zombie bar scene is shown above. Who said pop culture wasn’t part of culture, too? As wickedly fun as the concept may be, we can’t get over how skillfully rendered this piece is, too. Jamie is a Pittsburgh, PA-based illustrator and designer — check out more of her work at her website, Bittersweet Creations. We asked her a few questions below. JH: When I think of the word culture, I think not only about high art, theatre and architecture, but also popular culture. What is more pop-culture right now than zombies?! So, I wanted to melt this pop-culture idea of a post Zombie-Apocalypse with what would seem like an everyday scene in today’s culture. People drinking a great beer in a local bar. JH: I studied fine art as well as communications in college, but, I really think that most of what I have learned has been self-taught. I try to study on my own and experiment with different techniques as much as I can. I think that in your life, you should never stop learning and improving. JH: Well, all art generated by a computer has a basis in traditional techniques. If you look at Photoshop, the tools you use there are mimicking the tools used in darkrooms, design firms, by type-setters, artists and designers in past decades. But, you need to know how the tools work in real life to be able to use them effectively in the digital domain. I work almost completely digitally, but, I begin with a traditional thumbnail, which is followed by a traditional sketch and refined into a drawing before it is scanned into the computer. I really love illustration, so, I love Drew Struzan’s posters, Anita Kunz and C.F. Payne’s concept portraiture, and I love digital artists like Don Seegmiller. JH: Well, beer changed the world… It allowed people to have a safe beverage to drink when water wasn’t safe, it prompted the landing of the Mayflower and it was the beverage of choice for ancient Egyptians. Beer is definitely engrained in our human culture, spanning eons and reaching all over the globe. It brings us all together.